Home » Uncategorised » Course Day 2: Designing for People and One Big Windmill! Day two started with another introductory lecture and a more in-depth lecture on the history and design of Dutch city design as it evolved with cycling. The introductory lecture was given by Peter from TU Delft and was a basic breakdown of transportation in de Nederlands. It largely reinforced what we had read in our readings. Obviously, there are significantly higher rates of cycling in the Nederlands, especially for short trips. This is very obvious from the groceries and other bought items (including so far, 2-by-4s, a large TV and tennis rackets) that are being carted by bike. It’s much easier to do by bike here because it’s so flat and almost every bike comes pannier ready (which Americans pronounce PAN-EE-ERS, not Pann-EE-EH) with additional seats and basket holders on almost every service. It’s not hard to understand why bikes are such a large part of the Netherland’s planning culture. Our next lecture was from Mark Wagenbuur, a Dutch cycling expert. He runs a Youtube channel Bicycle Dutch and a related blog. Although he isn’t formally trained as a cycling transportation engineer, he clearly understood many of the issues and concerns. He spoke about the history of urban planning and policy related protests in de Nederlands, which I also think is covered quite while in Peter Jordan’s City of Bikes. 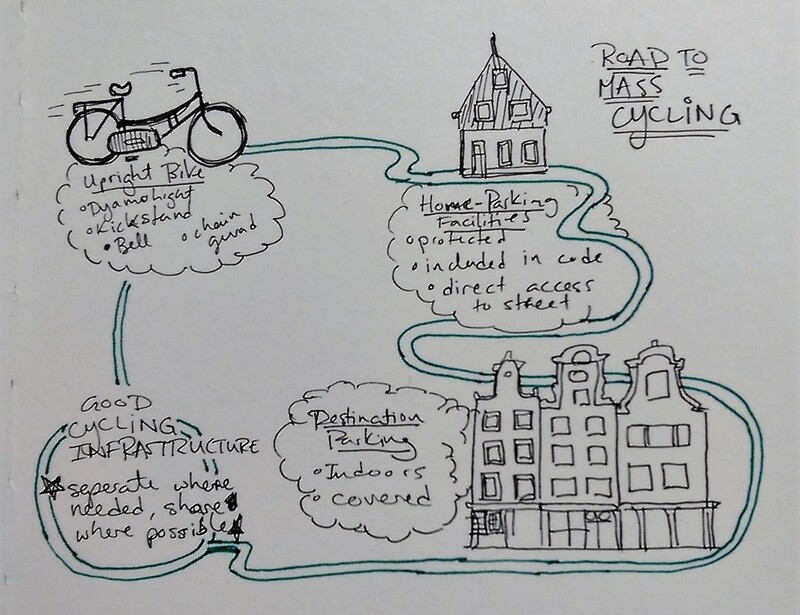 Mark had 4 things that convinced the Dutch cycling on mass: a bicycle, bicycle parking at home, bicycle parking at destinations and good cycling infrastructure. It’s a long road for us but worth taking. He also talked about how Dutch design their cities. Like the American engineers follow the ASHTO or NACTO manuals/guides, Dutch engineers also have guides they follow. Mark specifically drew attention to the CROW Manual (must find a copy!) their design manual for bicycling traffic. He also pointed us to the Sustainable Safety Policy and (federal) Dutch Bicycle Master Plan as important bicycling policy documents for the country. He also talked about a way of retrofitting and building suburban roads that encouraged local cycling trips. 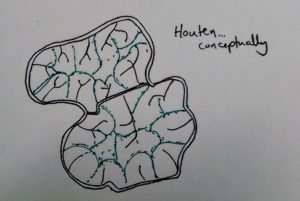 In the example of Houton (see image), roads that had previously gone through were closed off and neighbourhoods were “compartmentalized.” Cars must use the ring road and only cycling and walking paths connect neighbourhoods in the interior. Bicycling becomes the fastest way to travel within the community. Although I can think of neighbourhoods in Victoria and MetroVancouver that could benefit from this type of treatment, I can already think of some places that have. First, the street by my house where there was once street traffic and the parents of the neighbourhood successfully had it shut down to through traffic (after an elementary school child was hit while crossing the road in front of her house) and even defeated a second push to have it reopened. It was once such a major street that tour buses traveled through it, but now makes the neighbourhood safe AND accessible to local traffic and thru cycling traffic. Definitely some parallels to the Dutch history here. Second, UVic! It’s surrounded by a Ring Road and only service vehicles can travel through it. Place making: Turning streets into places, as is already being done temporarily in Ciclovías and car-free days. I think woonerf (living streets) might be considered a long-term type of place making. Complete Streets: create complete streets that allow for all modes to safety travel on the same street. Design a Cohesive Cycling Network aka #UnGaptheMap Vancouver! 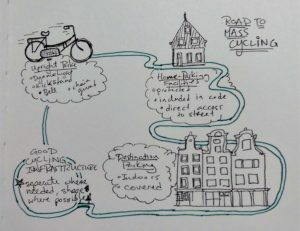 I was also able to ask about how Mark felt about skipping the “Complete Streets” phase and moving right to the “Plus Net” system Amsterdam is moving to. He felt that complete streets where important to change the mindset of people. Plus Net also depends on a cycling capacity that nowhere but Amsterdam really has. I feel like Mark had a very good response, but I’m now I’m wondering should our 50+ year plans include future planning for a Plus Net system? 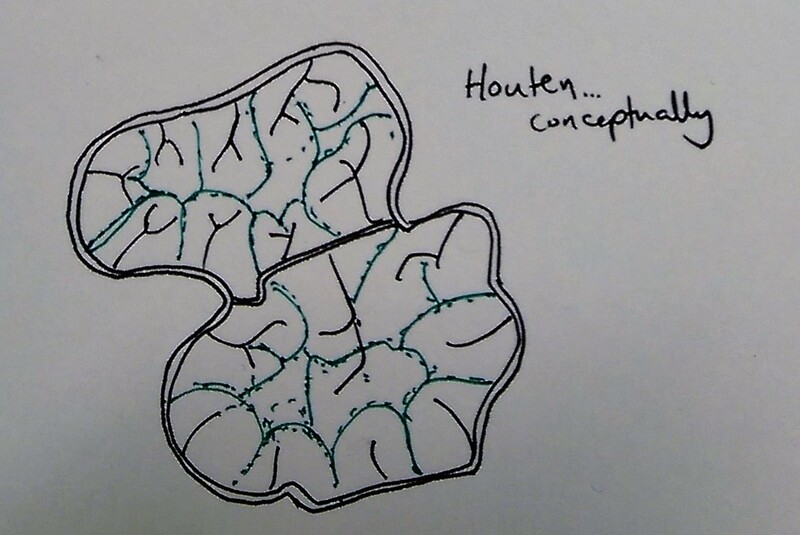 Or are cohesive networks of transportation enough? The bike tour we went on wasn’t very productive facility wise. We only made it to one destination. We did get to go into a very old windmill that had been renovated and was being run by some retirees. They still mill small batches of flour on windy days. 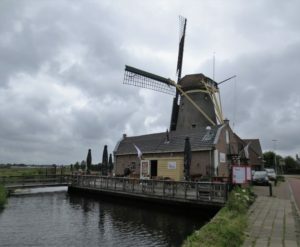 There is also a cute cafe beside the windmill called De Vang. All week we’ve been biking into the wind and fighting hard against it. I felt very connected to the past as we climbed two flights up into the windmill and watched the wind being used. It seems that gears are as much a part of the past here as they are the present. Spencer, Rex and I have also started to plan a weekend trip to visit Van Gogh-Roosegaarde Bike Path near Eindenhoven as well Hovenring. Apparently, we will be near some of the first windmill’s Van Gogh drew.